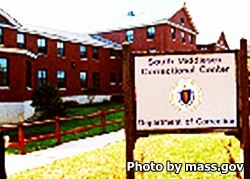 South Middlesex Correctional Center is located in Framingham Massachusetts. It is a minimum/pre-release center that houses over 200 female inmates. The prison is comprised of a single three story building that has administration operations on the first floor, and houses inmates on the second and third floors. This prison does not use a security fence and does not lock the inmates in cells because the security level is minimum and pre-release and the inmates pose little to no threat of absconding during the final months of their sentence. South Middlesex Correctional Center has a work release program that allows inmates to work jobs in the surrounding community during the day and report back to the prison at the end of their shift. Inmates participating in the work release program are required to pay 15% of their earnings which contribute to room and board costs. Offenders who have not reached a pre-release status, and are still considered minimum security can work as a carpenter, janitor, cook, or in a supervised community position for $3 per day.. Visiting is 6pm-9pm Monday through Friday for all inmates. Saturdays and Sundays are split into two sessions. The session your inmate can have visitors at will depend on the first letter of their last name. Saturday 12:45pm-4:15pm is for inmates who have a last name that begins with letters A-M, Saturday 6pm-9pm is for inmates with a last name starting with N-Z. Sundays 12:45pm-4:!5pm is for inmates with a last name N-Z, and 6pm-9pm is for inmates with a last name starting with A-M. Holiday visits are for all inmates from 1pm-4pm.